From the Start screen type Windows to Go. Make sure the context is set to Settings. Click on Windows to Go. Insert the USB 3.0 key that you will use for Windows to Go. 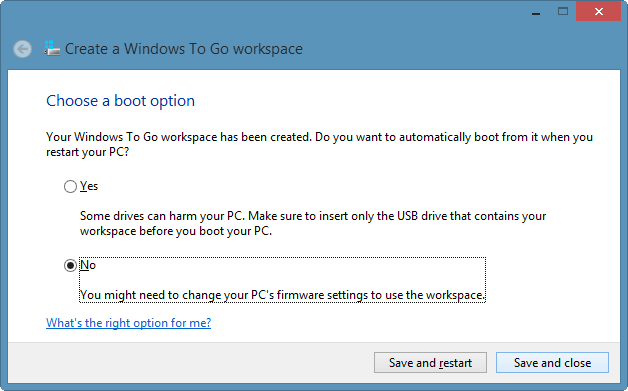 It should appear in the Create a Windows To Go workspace screen. Select it and click Next. On the next screen you are asked to point to a Windows 8 image. If you are using an ISO image rather than physical media make sure you mount it in Windows, and then navigate to the proper location. Click Next. On the next screen you are asked if you want to set a BitLocker password. Because it is assumed you will be using the Windows To Go key on multiple computers it used the same password technology as BitLocker to Go, rather than tying it to a TPM chip. You can either check the option to Use BitLocker with my Windows To Go workspace, or click Skip. The next screen is the Ready to create your Windows To Go workspace screen. When you click Create Windows will start building your key. Depending on the speed of your key and your USB ports (USB 3.0 is highly recommended, but not necessarily available) it can take between five and twenty minutes. Be patient, when the progress bar is complete, you will have your very own Windows To Go key ready to go! It really is easy… and when you are done you will be able to take all of your applications, data, and preferences with you to any computer you use… even older Windows 7 (or even Windows XP!) systems! Remember that I mentioned that one of the advantages to using Windows To Go is the ability to use unsecured computers safely. For that reason, when you boot into your Windows To Go key the local hard drives will be off-line. Likewise, if you insert your Windows To Go key into a computer running another installation of Windows, your USB key will be off-line. I said it before and I’ll say it again; Windows To Go is a real game changer. It is one of my favourite features of Windows 8, and one that I expect will have a lot of corporations looking at the new operating system, especially for road warriors, remote workers, and other employees who need to work away from the office. By the way, remember that you may still need to install hardware drivers for different computer systems, the way you do on traditional Windows installations. If you are planning on using the WTG key on multiple systems you might need to plan for that. Recently I did a demonstration of the Windows To Go technology at HP Canada, and had to download the driver for their 42” touch screen. It was worth it though… Windows 8 on a huge touch screen ROCKS! When your Windows To Go key is completed you will be prompted to either save and reboot, or reboot later. If you are building an individual key then you may want to reboot in order to install device drivers. For Bonus Points: Using the Microsoft Deployment Toolkit you can build your own image of Windows 8 which will include your applications, drivers, and domain settings. If you are building Windows To Go keys for your organization this might be a better alternative! What USB flash drive did you use for this? 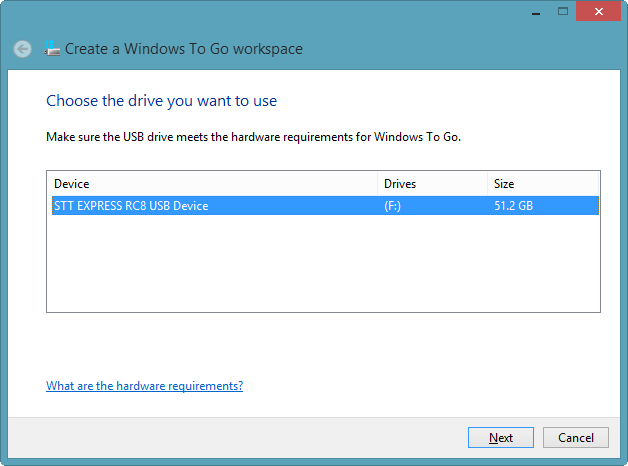 I know not all USB 3.0 flash drives will work with Windows To Go? I have two keys that I use… one is a Kingston DT Ultimate, and the other is a Super Talent USB 3.0 Express RC8. They are both excellent!